I was however, pleasantly surprised by the relaxed atmosphere at the competition and how friendly everyone was. I really enjoyed the experience and was fortunate enough to win £2,500 to support the development of my startup company, EuroBiotix. I also met a number of super interesting entrepreneurial medical students, which left me feeling energised and motivated. 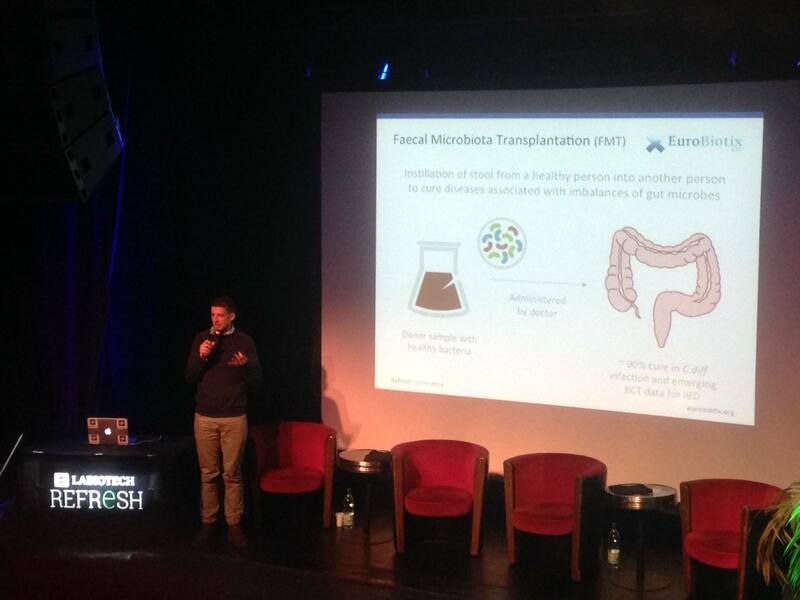 I founded EuroBiotix after identifying that doctors working in our NHS who wished to perform a medical treatment called Faecal Microbiota Transplantation (also known as FMT or a stool transplant) faced a number of difficulties. One difficulty is that because there is no NHS donor registry, doctors had to source suitable donors themselves. Donors usually come from family or friends of the patient suffering from the disease or infection that requires FMT. This means that for younger patients with a wide social circle, finding a donor is usually relatively straightforward. However, for older patients with a small social circle, finding a donor can take weeks or even months. Unfortunately, the majority of patients in need of FMT are over the age of 65, which means that using doctor-sourced donors critically limits access for these patients. Another difficulty is that doctors have to coordinate donor testing as well as handle donated samples themselves. This entire process is time consuming, not standardised and can be unpleasant. Our immediate aim at EuroBiotix is to support doctors and NHS hospitals to deliver FMT through the provision of standardised, ‘off-the-shelf’ pre-screened faecal transplant preparations for use in the procedure. We believe that this will dramatically reduce the costs and hassle that doctors currently face when they wish to perform FMT. Initially, our vision was to set up a blood transfusion service equivalent for faecal material in our local hospital. However, we now have a bigger vision of fully supplying the needs of all hospitals and clinical units in Europe. Since winning the Student Challenges Competition I have completed my fourth year of medical school, won a prestigious fellowship at the Royal Society of Edinburgh, and built our team to six people with expertise spanning across pharmaceutical medicine, project management and commercialisation. I have also raised over £100,000 for the company from a variety of sources such as the Scottish Government and the Royal Society of Edinburgh. Although running a startup involves a relentless amount of hard work, late nights and stress, there are definitely perks that should not be overlooked. My work at EuroBiotix has brought me a lot of happiness and has taken me to some amazing places such as the Scottish Parliament, Rome and most recently the Moulin Rouge in Paris, where I took part in a ‘startup battle’. Many people wake up on Monday morning dreading the week ahead, however I wake up on Monday morning energised at the prospect of one day improving the life of a patient in hospital. The next step for me is to close a six figure investment for the company to allow us to continue on our current trajectory. This will allow us to hire more staff, and undertake the necessary research and development to get our products to market in 2017. Running out of money is constantly a worry for all startup CEO’s, and the Student Challenges Competition provided us with some much needed finance at a critical period of development for the company. I would endorse the competition to any student entrepreneur. If the money that is up for grabs is not a strong enough incentive, the pitching event is a great experience that will stand you in good stead for investor pitches later down the line. This entry was posted in Student Challenges, Student Challenges Competition and tagged Student Challenges Competition. Bookmark the permalink.